말세의 징조들 - "원폭 1천억개급 태양폭풍 온다"…지구강타설 실체는? "원폭 1천억개급 태양폭풍 온다"…지구강타설 실체는? 대재앙을 일으킬 수 있다는 주장도 덩달아 고개를 들고 있습니다. 지난 7월 한반도에 느닷 없이 단파통신 장애가 일어났습니다. 정부 당국은 즉각 경보를 발령하고 촉각을 곤두세웠습니다. 대한항공 여객기가 갑자기 항로를 변경하는 비상이 걸렸습니다. 이 모든 돌발 사태를 일으킨 건 바로 태양의 흑점 폭발. 심상치 않은 조짐이라는 과학계의 우려는 각종 영화를 만들어내고 있습니다. 비행기가 추락하고 대지진이 도심을 집어삼킵니다. 화산이 폭발하고 지진해일로 육지가 온통 물바다로 변합니다. 에너지 입자들이 지구를 덮친다는 겁니다. 그렇게 될 경우 실제로 벌어질 수 있다는 극단적인 주장도 나옵니다. 덩달아 지구 종말론까지 확산되고 있습니다. 태양 표면에서 온도가 낮은 부분은 검은 점처럼 보입니다. 큰 것은 지구 지름의 10배를 넘는 것도 있습니다. 방사선은 단 8분 만에, 고에너지입자는 30분이면 지구에 도달합니다. 흑점 폭발은 태양이 생긴 이후 계속됐습니다. 아! 정말 놀랍고 두려운 일입니다. 심판 주이신 주님께서 곧 오실 것을 태양이 입증하고 있습니다. The Sun's odd behavior has been mentioned on many occasions recently. As we all await the Solar Cycle 24, scientists keep a close eye on the Sun. Now astronomers have discovered huge dark strip on the surface of the Sun. It is estimated this filament is about 800,000 km in length! Astrophysicists presume dark spots on the Sun are areas where the temperature is lower. However what we see here is not a normal sunspot and it is growing at an alarming rate. According to researchers the region has increased to almost one million kilometers in just three days. 최근들어 태양의 이상 현상에 관해 많이 언급되고 있다. 태양 24주기에 접어들며 과학자들은 더욱 태양을 주시하고 있다. 천문학자들은 태양 표면에 생긴 거대한 검은 줄무늬를 발견했다. 이 필라멘트는 길이가 무려 800,000Km에 달하는 것으로 추정된다. 천체물리학자들은 태양의 검은 지점이 온도가 낮은 지역이라고 추측한다. 우려할 만큼 커지고 있는 중이다. 연구자들에 따르면 그 영역은 단 3일만에 거의 1,000,000Km로 증가했다. This image (above) from NASA’s Solar Dynamics Observatory (SDO) shows a very long, whip-like solar filament extending over half a million miles in a long arc above the sun’s surface. Filaments are cooler clouds of solar material that are tethered above the sun’s surface by unstable magnetic forces. 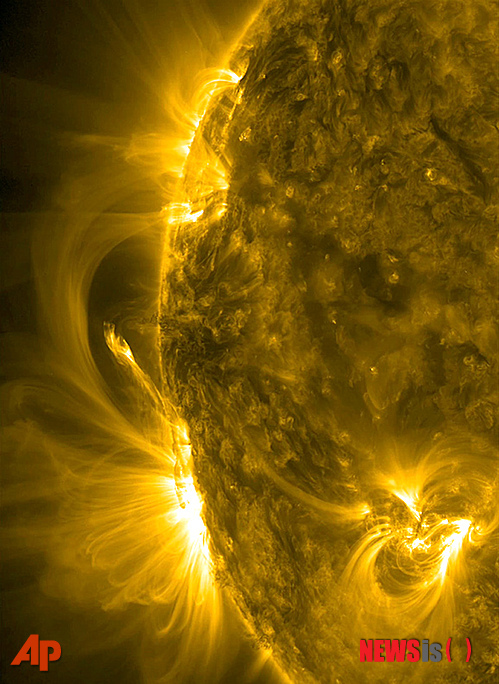 The image and video (below), which covers August 6 to 8, 2012 show the filament as a darker strand that has been in view for several days. Towards the end of the video part of the filament seems to break away, but its basic length and shape seem to have remained mostly intact. 기본적인 길이와 모양은 거의 온전히 남아있는 것으로 보인다. NASA forecasts that in September 2012, there will be outbreaks of unprecedented power. We can expect huge solar flares that can have serious effect world-wide. 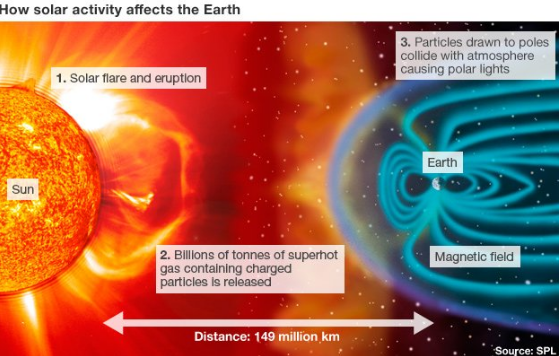 Commenting on the study of the dangers of "space weather", astrophysicist Daniel Baker claimed that the effects will be comparable to a nuclear war or the fall of a giant asteroid. However, in terms of power grids and satellites, it's not the flares that the experts have to worry about, but the CMEs. There is a risk that one day, they can wipe out all of our electronic civilization. 핵전쟁에 비교할 수 있는 영향이라고 주장한다. 언젠가 우리의 전자문명이 전부 휩쓸려버릴 수 있는 위험이 있다. 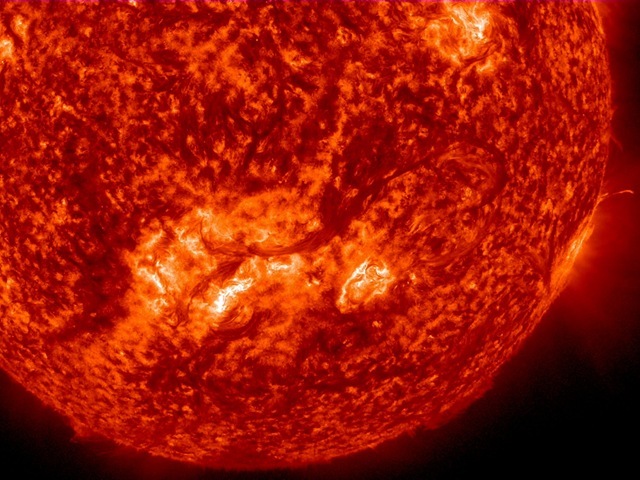 Solar storms can disrupt communication, and navigational equipment, damage satellites, and even cause blackouts by damaging power plants and electrical grid components. They can also bring additional radiation around the north and south poles; and this, in turn forces airlines to reroute their flights. According to a report published by NERC, the North American Electric Reliability Corporation, or NERC, which oversees North America's power grid we can feel the effects for several years to come. "Historically large storms have a potential to cause power grid blackouts and transformer damage of unprecedented proportions, long-term blackouts and lengthy restoration times, and chronic shortages for multiple years are possible," the report said. 태양폭풍은 통신, 네비게이션 장비를 혼란시키고 인공위성에 손상을 가할 수 있으며 발전소와 전력망 요소들의 붕괴로 정전을 일으키는 요인이 될 수 있다. 그리고 이것은, 항공기들이 항로를 강제로 바꾸게 한다. 북미 전력망에 몇 년간 미칠 수 있는 영향을 느낄 수 있다. 잠재성을 가지고 있다"고 보고서는 말한다. This filament happened on Aug. 5th, 2012. 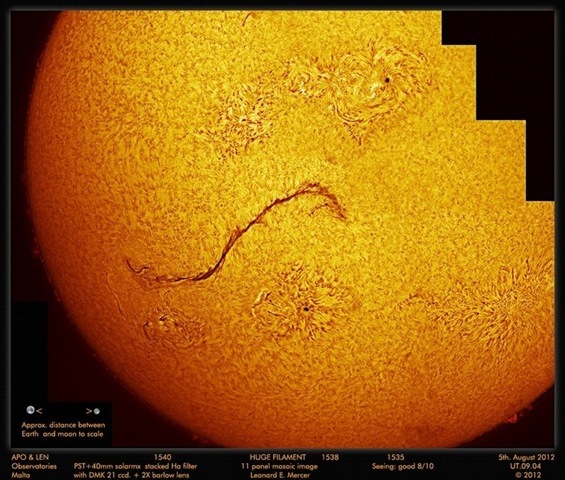 11 images were put together to create this huge filamament on the Sun. amateur astronomer from Malta, who contributes with many astrophotos. Richard Andres, an energy and environmental security expert at the military's National Defense University (NDU), is helping to coordinate an interagency group to deal with the problem. The failure of the national power grid could be disastrous, he said. In a worst-case scenario, commerce would almost instantly cease, he said, noting he was speaking for himself and not the U.S. government. Water and fuel, which depend on electric pumps, would stop flowing in most cities within hours, modern communications would end and mechanized transport would stall. 군의 국가 방위대학교(NDU)에서 에너지 환경보안 전문가로 있는 리처드 안드레스는 이 문제를 다루는 관계부처간 그룹을 돕고 있다. 국가 전력망의 부족은 재앙적이라고 그는 말했다. 기계적인 수송이 오도 가도 못하게 된다. Backup generators for hospitals, the military, and other critical facilities would be vulnerable if they depended on diesel or natural gas, which also rely on pipelines for resupply. The report said more than 130 million people in the United States could be affected. Andres said the death toll could run into the millions in the worst-case scenario. How many people will suffer world-wide? We can only make guesses about the number of deaths. Space weather experts already warn that the next solar storm can be much worse than previously expected. 의존하거나 재공급을 파이프라인으로 할 경우 취약하게 된다. 보고서에는 미국에서 1억 3천만명 이상이 영향을 받을 수 있다고 되어 있다. 안드레스는 사망자수가 최악의 경우에 수백만에 달할 수 있다고 말했다. 단지 생각만 할 수 있을 뿐이다. 더욱 나쁠 수 있다고 이미 경고하고 있다. 우주에서 우리의 보호막으로 행동하는 지구의 자기장은 구멍을 가지고 있다. "It's a lot like asking how many trees would fall in the next hurricane," a government expert said. "We don't know that, but we do know that there will be a hurricane. When we have another space weather superstorm, there will be an effect on the grid. We're trying to understand now what that effect is going to be." We should hope for the best, but be prepared for the worst. "그것은 다음 허리케인에 나무가 얼마나 쓰러질까지 질문하는 것과 같다. ", 정부의 한 전문가가 말했다. "우리는 알 수 없다. 하지만, 허리케인이 일을 거라는 것은 안다. 또다른 우주기상 수퍼폭풍이 생길때 전력망에도 영향이 있을 것이다. 우리는 그 영향력이 무엇일지 이해하려고 지금 노력하고 있는 중이다." 우리는 최선을 기대해야 하지만 최악을 준비해야 한다. *태양폭풍, 내년 5월 지구 강타說 아십니까? 2012년도 올해는 8월 16일 현재 0일. 올해는 지금까지 하루도 빼놓지 않고 흑점이 관측됐다. 태양의 활동이 점점 격렬해지고 있다는 얘기다. ‘2013년 초강력 태양폭풍의 지구 강타설’도 덩달아 고개를 들고 있다. 이를 막아줄 유일한 보호막은 지구를 감싸고 있는 자기장. 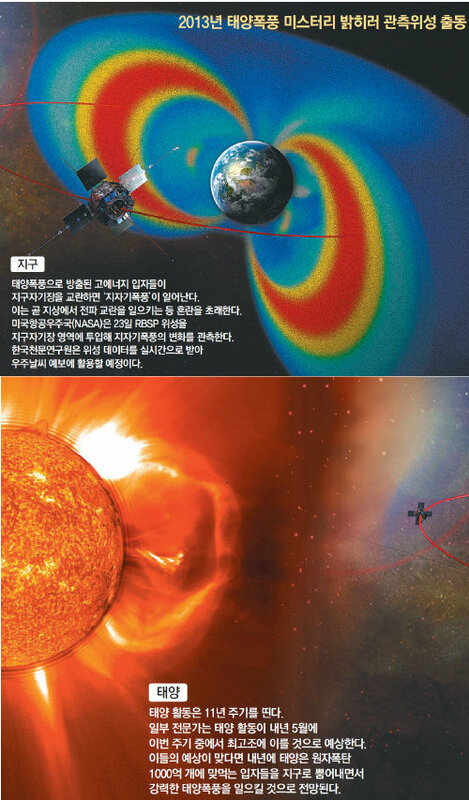 관측위성(RBSP·Radiation Belt Storm Probe)’을 전격 투입한다. RBSP의 임무는 지구자기장의 변화를 실시간으로 측정해 보고하는 것이다. 지구자기장은 태양폭풍에서 생긴 입자들과 만나면 교란현상이 발생한다. 태양폭풍으로 인해 ‘지자기폭풍’이 생기는 것이다. 지구 적도면을 따라 편대비행하면서 지자기폭풍의 변화를 감지해내야 한다. 사용되고 있다는 것을 확신하게 됩니다. 전파되기 위한 것이라는 것을 알 수 있습니다. 구원받을 하나님의 사람들은 그 사실이 믿어 질 것입니다. 준비를 철저히 하게 될 것입니다. 인터넷의 공간에는 무한대로 많은 자료가 담겨 있습니다. 많은 자료가 있는 인터넷 공간에서 위의 태양에 대한 자료들을 발췌하였습니다. 징조를 보아 알 수 있다고 성경이 확증시키십니다. 주님을 맞이할 준비를 할 수 있기 때문입니다. 주님은 인터넷 매체를 통해 그런 징조들을 빛의 자녀들에게 보여 주십니다. 그 때를 미리 보여 주십니다. 그리고 그것이 진리임을 오직 말씀으로 확증시켜 주십니다. 전파되리니 그제야 끝이 오리라" 의 말씀이 응하게 될 것입니다. 지금은 주님을 맞이하기 위해 준비 하여야 할 때 입니다.